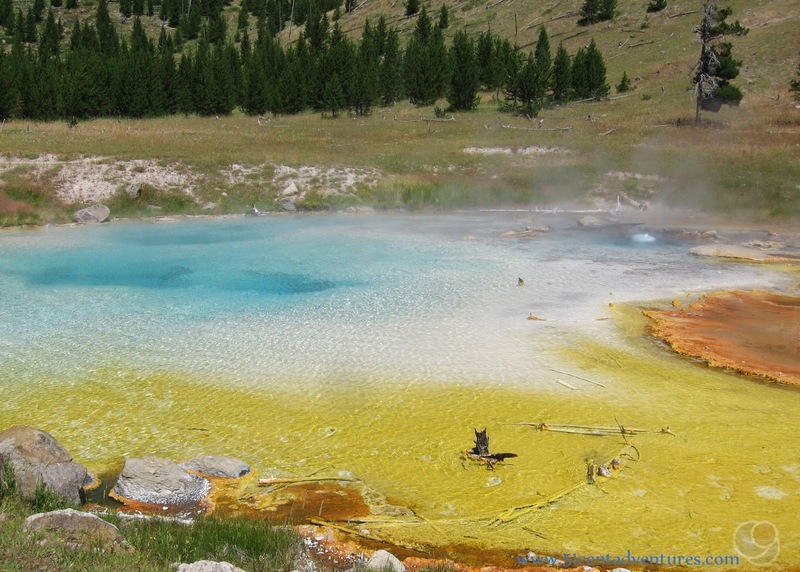 Imperial Geyser is the best kept secret in Yellowstone. This fountain geyser shoots up water in plumes as high as 15 feet. Adding to the beauty is the colorful pool of water next to the geyser. The geyser is located within a mile of Fairy Falls, and is listed on maps and in guide books as a great add-on to a hike to Fairy Falls, but it should be considered a destination in it's own right. Location: The trail begins at the Fairy Falls/Fountain Freight Drive parking lot located 1.5 miles south of the Midway Geyser Basin parking area. Imperial Geyser is located .7 of a mile from Fairy Falls. Open Season: The trail opens the Friday before Memorial Day and is open through the end of September. In the summer of 2017 I received a job with Xanterra Parks and Resorts in Yellowstone National Park. I moved there with my husband and our four young children. We lived in a 25 foot RV and spent all our free time exploring the park. 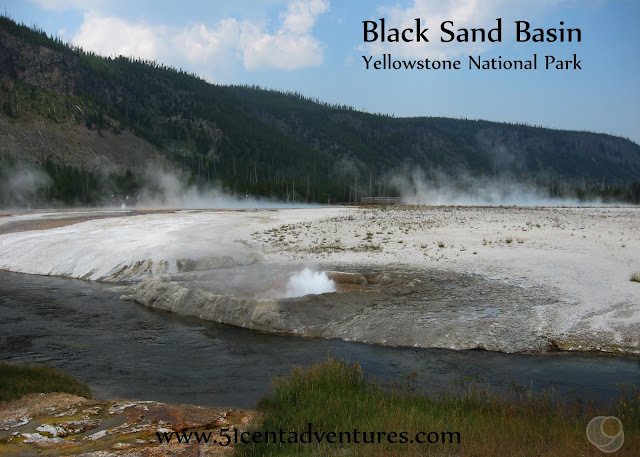 This is the seventh of many posts that I will write about specific features within Yellowstone National Park. At first these aren't going to be in any particular order, but in a few months I'll start grouping them into lists. This one would probably fit into a list such as best day hikes in the park. 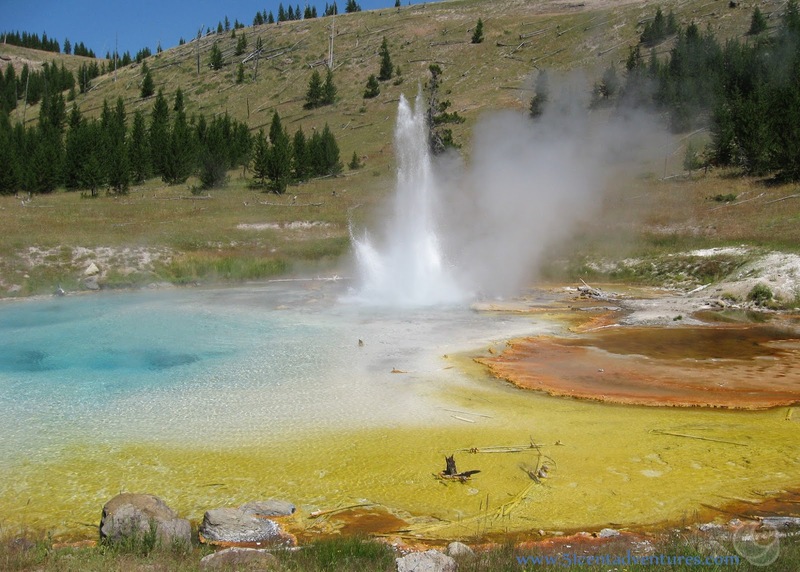 I'd never heard of Imperial Geyser until I read about it in "A Ranger's Guide to Yellowstone Day Hikes" by Roger Anderson and Carol Shiverly Anderson on the day my family decided to hike to Fairy Falls. The geyser was mentioned as a side trip from Fairy Falls, but there was really nothing written about it that made me say, "We have to see this!" Instead I kept trying to convince my husband that we should probably just skip the sidetrip. We were already taking the long way to Fairy Falls via the Imperial Meadows trail (more about that in my next post), and I didn't want to waste time and energy going to see some geyser that would probably be two feet tall if it even erupted while we were there. My husband was persistent and convinced me that since we'd already come all this way we might as well go a little farther to see the geyser. He reasoned that if it was big enough to be named on the map it was bound to be at least sort of interesting. So we followed the signs to Imperial Geyser and soon arrived at a small geyser spurting out water. I wasn't impressed and wished we had skipped it. But my husband noticed a run off channel that seemed to be coming from farther up the trail. So he went up the trail to investigate. After about 10 minutes he came back grinning and said that the real Imperial Geyser was located 100 meters up the trail. He said that he'd watched it erupt for about 5 minutes. The eruption had stopped, but had started again after only a minute's rest. 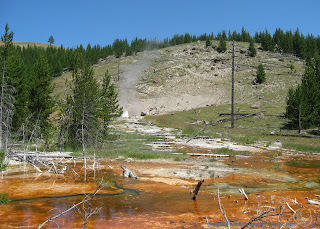 We hurried up the trail and arrived at the geyser during a quiet period. 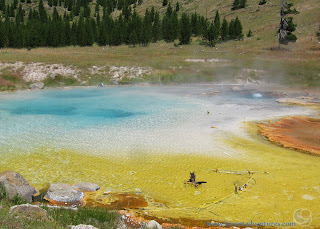 Even without an eruption the geyser pool was beautiful. The water was a shimmery turquoise blue surrounded by white sand. The sand was ringed by yellow and orange algae. After a minute or two, Imperial Geyser splashed back to life, and I fell instantly in love. 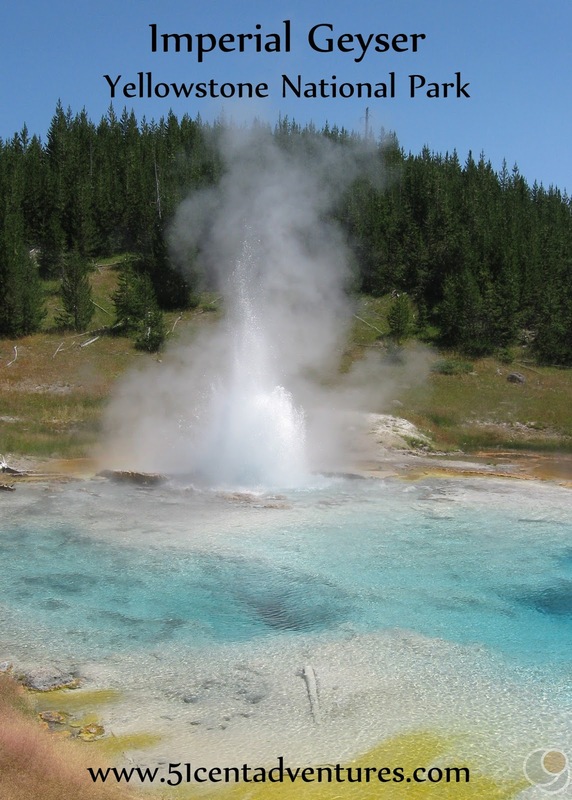 Imperial Geyser is a fountain geyser which means it shoots out bursts of water. Some bursts were small, but other's were over 15 feet tall. I love fountain geysers because the water patterns are random. You never know when or how high the water will shoot up. We found a shady spot under a tree near the geyser and ate lunch while watching the geyser erupt. This was one of the best half hours I spent in the park. Imperial Geyser put on a show for us the whole time we were there. I didn't film a lot of footage while we were in Yellowstone, but I did record about a minute of Imperial Geyser's eruption. Apparently Imperial Geyser was quite the darling of Yellowstone in the 1920's. It was known to erupt for up to 6 hours and shoot out water in plumes as high as 150 feet. In 1929 the geyser fell silent and didn't have any eruptions of note until 1966. Hopefully it continues to erupt on a regular basis because this was such a joy to watch. I hope you have a chance to see it erupt too. Recommendation: The side trip to see Imperial Geyser is definitely something you should do if you are already planning to hike to Fairy Falls. 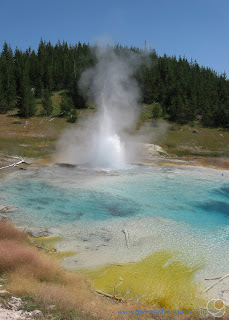 In fact, this geyser makes the Fairy Falls trail even more worth your time. Directions: The Fairy Falls Trail Parking lot is 1.5 miles south of the turn off for the Midway Geyser Basin on the west side of the lower loop of the Grand Loop Road. It is not well marked and does not show up on all maps yet. But the parking lot is large and visible from the road so you should find it okay. Follow the trail to Fairy Falls and then continue west to Imperial Geyser. There are signs along the way to help you know where to go. 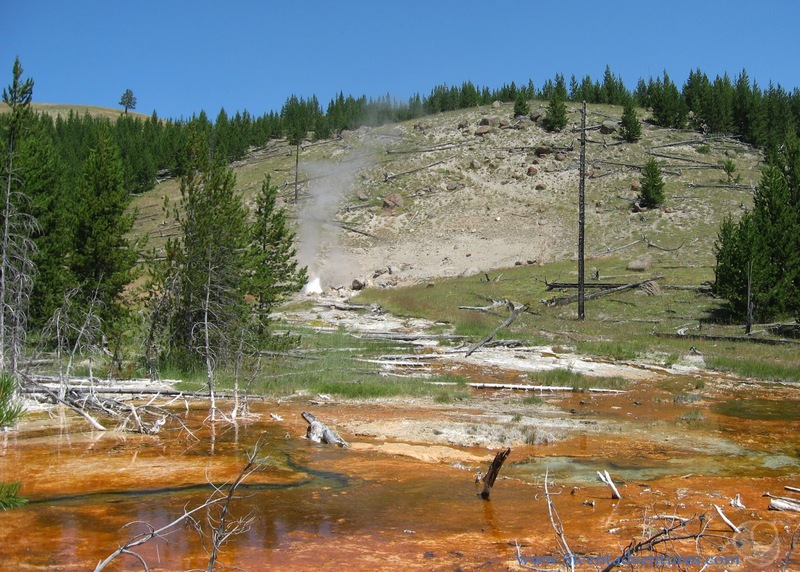 Additional Information: If you are really in the mood for adventure you can hike to Imperial Geyser via the Fountain Flats/Fountain Freight/Imperial Meadows trail. That's the route my family took.